Blackjack is one of my favorite games in the casino. I'm a casual player, and certainly not an advantage player by any means. To help me drill basic strategy, especially for things like soft hands and splits, I decided to write a version of Blackjack for Windows 8 and make it a game that *I* would like to play. Since I'm not a high-roller, I also wanted to simulate the bankroll that casual players might use in an actual casino: $500 buy in at a $10 minimum table. Thus, Knave 21 (soon to be renamed Knave Blackjack) was born after a couple of hundred hours of work in the evenings and weekends (the version in the Windows Store represents the third rewrite, and a version currently in development has undergone major refactoring recently as I prepare to add more features in the near future). It's been a labor of love, and I hope that the attention to detail reveals that. I've received a lot of positive feedback, and, recently, some negative feedback as well (which prompted this blog post). More importantly (and in response to some recent negative feedback), the game doesn't care what cards have been played or how much you are betting when determining the next card - it simply picks a random number and that's the card that is drawn. I'm very concerned about Knave 21's reputation, especially since I have paying customers now that the app is listed in the Windows Store. In the interest of openness, the code for the shoe implementation follows. Note the "nextCard" function for the RNG implementation. Now, when you write a Metro application using .NET or C++, there's a compilation step that takes place to compile the source code into an executable (EXE and/or DLL). The executable and any dependencies are packaged into an application package (an .appx file), which is really just a renamed .zip file that contains the files, a manifest, and cryptographic information to ensure that the contents were not tampered with. 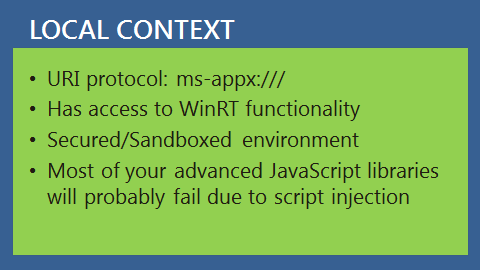 Aside from WinRT libraries, everything that is needed to run the application must be included in the package. 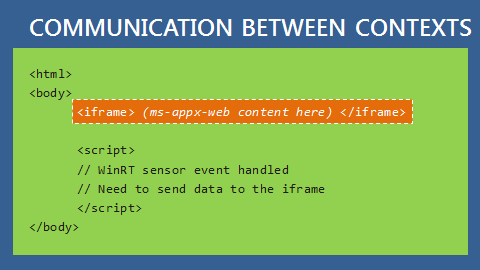 In practice, an IFRAME is used to introduce Web context content into a Metro application. 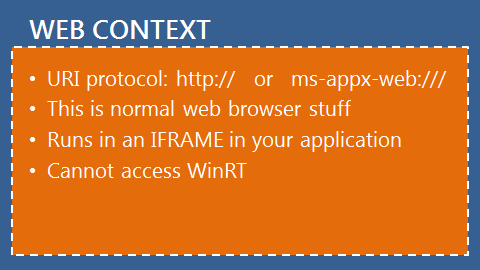 In this way, the outermost web page runs in the Local context, while the IFRAME's content runs in the Web context. It's possible for the IFRAME to be styled to fill the entire screen, if needed (and the outermost web page becomes just a thin hosting shell). A common scenario is that data in the Local context will need to be sent to the web context (and vice versa). For instance, code running in the Local context may listen for events fired by the device's Compass sensor. When a new directional heading is established, the Local context code will need to send the new data to the Web context code for further processing. HTML5 defines a means to do this cross-document communication using the window.postMessage() function. In the case of the new Compass reading, the Local context code would post a message to the IFRAME. 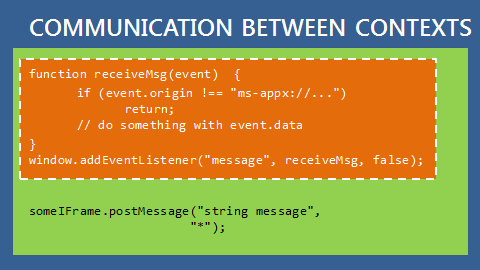 The Web context code would need to register an event listener for the window's "message" event.